Laptop users who forget to print out addresses or meeting room numbers don’t have to wait for their laptops to boot up to check the information. 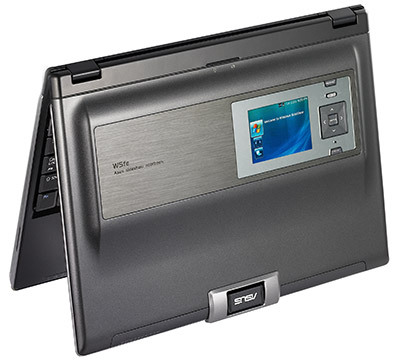 A laptop from AsusTek computer Inc has a 2.5-inch secondary liquid crystal display that allows people to check recent emails, photos, videos and calendar items using the “SlideShow” feature of Microsoft Corp’s latest operating system, Window Vista. The external display has one gigabyte of flash memory and, because it uses little power should be able to last 50 hours before recharges. The display module can be programmed to sync up with selected data on the computer regularly such as every hour or when the computer powers down. Information is viewable even when the computer is off. The laptop, which will cost “US$1,799 to US$1,899, is expected to be available after Vista’s Jan 30 consumer launch. Read the press release from Asus. The compact 12″ wide notebook with cutting-edge SideShow, external auxiliary display on the LCD cover, offers high mobility with quick and easy data access convenience.